*the Kanji character of “yawaragi” reads “wa” in another way. He also appeared on the NHK evening news on Monday, when he explained the importance of Japanese traditions and spirit along with Japanese blossoms and culture. Regarding the scent bag which also appeared in this poetry, it is a bag stuffed with Santalum album or Eupatorium japonicum. Even since 7~8C, these kinds of plants have been attracting people in this country. The “Man’yoshu” includes not only Eupatorium japonicum, but also Japan’s seven flowers of spring such as Dianthus and Patrinia scabiosifolia. This shows the culture of enjoying flowers to compose a poetry originates from this collection. 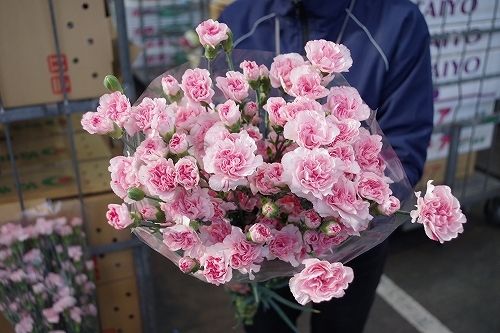 Now, the flower industry is going towards the big annual event, Mother’s Day, when Dianthus like Carnation gets so popular. There may be some opportunities to advertise Dianthus with this new era’s meaning. After the announcement of the new era’s name, a lot of “Reiwa” phenomena have been seen such as the special edition of newspapers is selling at a high price, or the made up character “Reiwa-chan” has been viral on twitter. It is needless to say that “Man’yoshu” has suddenly got so popular that many are being sold out, but we hope flowers in that collection also attract people’s attention and hence Japan will be cheered up by beautiful flowers with a lot of flower lovers.